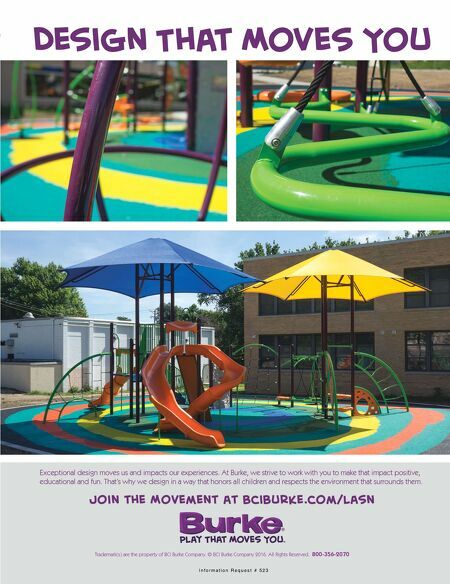 28 Landscape Architect and Specifier News product focus (Continued from page 26) Click on any picture to go directly to that product on the company's website. *To receive more information from vendors, use the reader service card on page 123. Shown is a custom fabricated 84" x 92" x 42" stainless steel spa with a lounger, bench seating, LED lighting and a water spout. Information Request # 1017 www.diamondspas.com Diamond Spas Maximize potential by quickly building a strong root base. Perfect for landscaping, and transplanting trees of all sizes. Check out our blogs. Information Request # 1005 www.superthrive.com The Vitamin Institute Our handmade Italian terracotta is from Impruneta, a small town known to produce some of the best terracotta in the world. Information Request # 1010 www.tuscanimports.com Tuscan Imports Specializing in the construction of artificial rock formations, trees, water features, landscapes, slope stabilization and erosion control. Information Request # 1000 www.cemrock.com Cemrock Landscapes, Inc. Legacy Grills _ commercial grade stainless steel for all major components. Seam welded and polished edges for an elegant appearance. Information Request # 1022 www.aeicorporation.com AEI Corporation Let us create a cool refreshing spot in your backyard with one of our many pergolas. We can create a shady spot for you to curl up and relax. Information Request # 1031 www.myoutdoorrooms.com My Outdoor Rooms DRIVABLE GRASS® is a permeable, flexible and plantable concrete pavement system for driveways, parking lots, fire lanes, access roads, bioswales. Information Request # 1026 www.soilretention.com Soil Retention Products, Inc. Incorporate vibrant solar-reflective colors that help minimize the urban heat island effect by specifying SOLACHROME™ High-SRI Concrete Systems. Information Request # 1003 www.scofield.com L.M. Scofield Company When some residents of Luther Manor, an upscale 81-unit senior citizens home in Waterloo, Ontario, found it too physically taxing to lift the lid on their dumpster, they had the inspiration to just leave the "damn lid" open all the time! Problem solved. Well, not really. "It is like a third world country here in the summer - the flies, maggots and stench," says Steve Roe, the building's superintendent. "The maggots then find their way into the building." Re maggots: Miles Olson, author of 11 Edible Insects and How to Eat Them, notes that maggots are a "traditional super food … and many cultures have relished maggots, leaving fish or meat out to become saturated with them and then eating the maggots raw." No one at the senior center suggested maggots be added to the menu. Luther Manor's trash problem, however, was more than insects. Rainwater would get into the dumpster and leach out a toxic mixture on the hardscape. Also, parking spaces were being given up to allow the garbage truck to access the dumpster. Then there were the decks of some of the homes that face the dumpster and recycling bins. Not an engaging sight. In addition, the dumpster and bins were next to one of the main entrances. 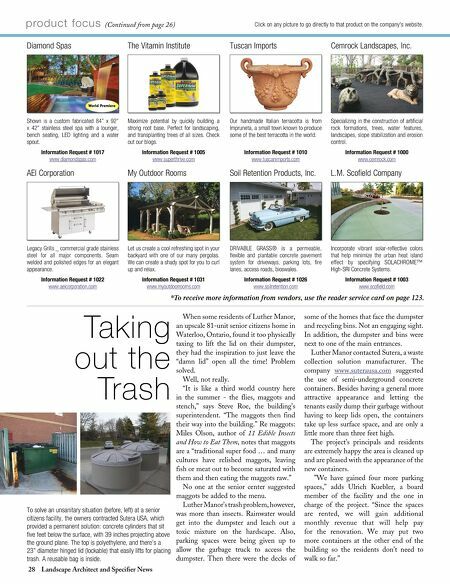 Luther Manor contacted Sutera, a waste collection solution manufacturer. The company www.suterausa.com suggested the use of semi-underground concrete containers. Besides having a general more attractive appearance and letting the tenants easily dump their garbage without having to keep lids open, the containers take up less surface space, and are only a little more than three feet high. The project's principals and residents are extremely happy the area is cleaned up and are pleased with the appearance of the new containers. "We have gained four more parking spaces," adds Ulrich Kuebler, a board member of the facility and the one in charge of the project. "Since the spaces are rented, we will gain additional monthly revenue that will help pay for the renovation. We may put two more containers at the other end of the building so the residents don't need to walk so far." Taking out the Trash To solve an unsanitary situation (before, left) at a senior citizens facility, the owners contracted Sutera USA, which provided a permanent solution: concrete cylinders that sit five feet below the surface, with 39 inches projecting above the ground plane. The top is polyethylene, and there's a 23" diameter hinged lid (lockable) that easily lifts for placing trash. A reusable bag is inside.